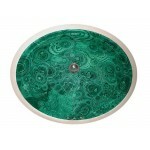 Go all out and add this design for an eclectic look, great in any style of bathroom. 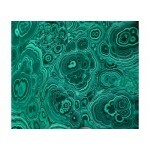 Faux Malachite looks just like the real thing but is hard and durable and will last through the ages on your basin. Light and dark green formations are one-of-a-kind and give it a unique ornamental quality.